MANILA–Self-rated disaster preparedness among Filipinos is low: only 36 percent of households reported feeling fully prepared for disasters, a recent study by the Harvard Humanitarian Initiative (HHI) DisasterNet Philippines reveals. With almost a quarter of the population considered poor, most Filipinos cite money as the main barrier preventing them from preparing for disasters. Among the 4,368 Filipino households surveyed across the country, 74 percent were unable to invest in disaster preparedness, mostly due to lack of funds (47.5 percent) and lack of time (20 percent). In the Autonomous Region in Muslim Mindanao (ARMM) alone, 92 percent reported insufficient funds. Despite campaigns by the government, nongovernment organizations (NGOs), and media, nearly 47 percent of respondents claimed to have done nothing to prepare for a natural hazard in the last five years. Although most respondents claimed to have discussed emergency plans with family members when prompted (83 percent), most respondents do not have a ‘go-bag’ or emergency kit (82 percent), and first aid kit (62 percent). Strikingly, very few Filipinos are adequately insured to deal with disasters. Only 19 percent claimed to have life insurance, 56 percent had health or medical insurance, three percent had home insurance, and two and a half percent had asset insurance. Respondents living in areas more frequently impacted by typhoons perceived themselves as being more prepared. 52 percent of residents in Eastern Visayas felt very prepared, with 49 percent in Bicol, 44 percent in Western Visayas, and only 32 percent in the National Capital Region (NCR). Similarly, advance discussions on disaster at the household level were high in Bicol, Western Visayas, and Eastern Visayas. The lowest level of preparedness cited was in Northern Mindanao with only 31 percent. 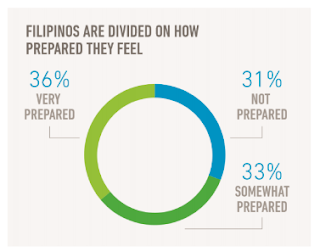 Furthermore, most Filipinos believed they are self-reliant in preparing for a disaster and cited their experience with previous disaster as the reason for being prepared for future events. Unsurprisingly, the study shows a large portion of the population (42 percent) had experienced significant damage to property, assets and had been displaced from their homes due to a disaster. In Eastern Visayas which was severely hit by Typhoon Haiyan in 2013, 97 percent of homes were either partially damaged or completely destroyed at some point by a disaster. At a national average, 16 percent of the population had been displaced for at least a week and seven percent for more than three months. The study also revealed Filipinos’ perceptions on ability to cope and recover was limited. 38 percent felt they would have difficulty recovering from a disaster in the near future, and only 22 percent were confident they would be able to recover. People living in the Visayas noted the longest periods of time required to recover from disasters. In terms of assistance, the vast amount of support Filipinos received in the aftermath of a disaster was provided by LGUs (52 percent), which is consistent with the country’s national disaster management policies. The assistance received following a disaster came in the form of food and water (57 percent), emergency shelter (five percent), medicine (eight percent), temporary employment or cash (four percent), or livelihood assistance (four percent). Temporary employment and cash-for-work represented a small portion of overall aid received by Filipinos with the exception of those living in Eastern Visayas (20 percent) and Western Visayas (17 percent). The study, conducted in 2017, aims to highlight people’s perceptions of their own level of disaster resilience and experience with disaster preparedness systems in the Philippines. “The HHI report offers important insights into the way Filipinos understand and prepare for a variety of natural hazards that they face. The first nationwide survey of its kind in the Philippines, the data offer a rich look into material levels of preparedness, Filipinos’ views on climate change and its anticipated impacts and offers unique reflections on Filipinos’ expectations of who is responsible for disaster response,” HHI Resilient Communities Program Director Vincenzo Bollettino said. The DisasterNet Philippines program of HHI will continue to engage with relevant government agencies, NGOs and other academic institutions using evidence-based approaches to contribute to understanding disasters and resilience especially at the household level.